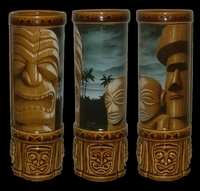 Sunrise Tiki Mug This is the 1st ever Tiki mug (to the best of our knowledge) that features 4-color process clear glaze coated & fired art! This is a technique that I've been working on for the last few years and am finally able to offer up to our collectors. It took a lot of testing to finally nail it on the head but we finally dialed it in and proudly present you with the 1st ever Tiki art print mugs! We've been able to offer up 4-5 color spot art mugs in the past but never before in full process art! I chose one of my all-time favorite Tiki artists Scott Scheidly and took my 2 favorite prints of his and hope that you enjoy them as much as we do here at the Farm. Sunrise Tiki measures in at 8" and has a 14 oz. capacity.